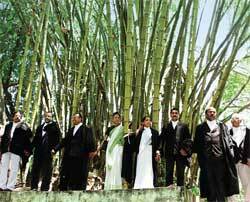 This bamboo cluster is the latest client of these advocates from the High Court of Kerala, Ernakulum. Recently, when the authorities wanted to cut down the bamboo, which has been there on the court premises for long, the lawyers came to its rescue and staged protests. They are also members of the Lawyers Environment Action Front. 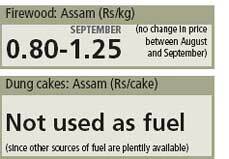 Grain prices will be under check this festive season, said the Centre as it has released 0.9 million tonnes of wheat to states governments and Union Territories. Gene Campaign, an advocacy group, has sought a ban on field trials of Bt rice across India. The tests are violating regulations laid down for GM crops, it said. India joined the International Lunar Network to establish robotic science stations on the Moon. The effort is part of future investigations of the lunar surface. Embryonic stem cells will be obtained from cloned human embryos in Australia, which gave the first licence to Sydney IVF, an in-vitro fertilization firm with access to 7,200 human eggs. Waste water from a garbage treatment plant at Patto, Panjim, flowed into Ourem creek, killing fish and affecting mangroves. Japan's farm minister, has resigned following a toxic rice scandal. Food company Mikasa Foods had sold 400 tonnes of rice tainted with pesticides and mould to 300 Japanese firms. China's environment ministry warned local government leaders will be held personally accountable for continued pollution in major rivers and lakes. Sri Lanka President Mahinda Rajapaksa asked Parliament to reconsider the ban on loudspeakers and draft a new environmental bill keeping in mind the needs of religious groups and artistes. Noise pollution from vehicular traffic in Karachi is at an alarming 85 decibels, according to Sindh Environmental Protection Agency. 60 decibels is the moderate level. Apple claims its new fourth generation iPod nano is the "cleanest" and most "toxic free". Made of more recyclable materials, it is free from toxic chemicals like arsenic and polyvinylchloride. European Parliament voted 10 per cent of vehicular fuel are to come from renewables by 2020. Of this, 40 per cent will come from sustainable sources , not crop-based biofuel. Shell is expected to sign a deal with Iraq in October to develop its southern oil fields. This follows China's revival of a pre-war deal to develop Ahdab oil field. South Africa approved a plan to increase the nuclear contribution to power from 5 per cent to over 25 per cent by 2025. Protests in Bolivia against President Evo Morales' plans to redo the constitution and control gas revenues intensified towards mid September. World Bank cancelled an oil pipeline deal with Chad saying that the government had failed to use oil revenues to tackle poverty as agreed in the deal. The Ozone hole by the third week of September became 27 million sq km in size, the largest ever, said World Meteorological Organization. A 1.5 inch-long Armoured Mistfrog, believed to be extinct, has been discovered in Australia's tropical north. A rare tree frog has also resurfaced in Costa Rica. Wild okapi, a giraffe-like animal with zebra stripes on its rear, has been spotted in Congo's Virunga national park, 50 years after it was declared extinct. Chile has banned whaling in its Pacific Ocean territorial waters. Death toll from a landslide set off by collapse of an illegal mining dump in China's Shanxi province rose to 254 by September 13, prompting the governor to resign. 11 provinces in Thailand were declared disaster zones after flash floods hit 114,345 people and inundated over 16,370 hectares of farmland in early September. ISRO will send Chandrayaan-1 to the moon this month. The spacecraft will learn more about evolution of the moon and map its surface for minerals like helium-3. EU plans to sue India again at the WTO for keeping European wine and spirits out of its markets by levying high import taxes. 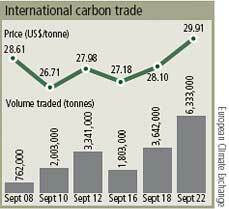 South Korea launched its first carbon trading firm, Korea Carbon Finance, to trade carbon offset credits, worth US $4.3 million, with industrialized nations. Bottled water sale stops in Gothenburg, Sweden, from this month. The city administration, which bought 39,000 litres of bottled water last year, has asked its employees to drink tap water. Google head Eric Schmidt said US would cut half its emissions and save 77 per cent of money spent on energy by switching to renewables and hybrid cars by 2030. Fossil forests dating back 300 million years were found in coal mines in Illinois, USA. Similar fossils were reported along Indiana and Kentucky borders last year. Goats rented by Los Angeles Community Redevelopment Agency will clear weeds in a 1.1 hectare patch. They are environmen friendly and cheaper than petrol-powered weed-whackers, it says. Togo, West Africa, confirmed an avian flu outbreak after 3,500 birds were found dead in 3 farms in a village in early September. 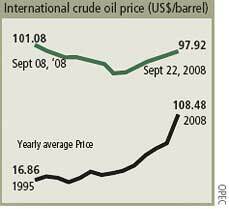 Petrol prices would go up further as Hurricane Ike shut down production at 12 oil refineries and slowed operations at 9 in the Gulf of Mexico, said US officials.